In a year filled with highly anticipated sequels, this weekend brings a... highly anticipated directorial follow-up? Hey, it's something. Two years after loudly announcing his arrival on the filmmaking scene with social-horror (and Oscar winning!) 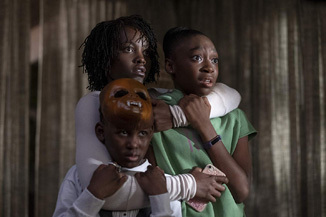 smash Get Out, Jordan Peele has his second film in the genre in theaters this weekend, simply titled Us. The big question for this sophomore effort is whether he has established himself as a brand as a director, a la Spielberg or Tarantino or more relevantly, and let's hope this isn't a jinx, Shyamalan, capable of selling a movie based on who's behind the camera rather than what's in front of it. Leaning less towards the outright racially-tinged social commentary and more towards just, general social commentary, Us centers on a young family (Lupita Nyong'o and Winston Duke and their two kids) who while on vacation encounter what appears to be a group of doppelgängers. Creepy enough, but then they seem to be expressionless, dripping blood and stalking their house. While this is the point that most families would just skedaddle like the famous Eddie Murphy stand-up bit it's not so easy in this case, as how do you escape from yourself? Peele's move away from explicit racial themes is probably a smart one, considering his career trajectory. While it's clearly his wheelhouse, you probably don't want to become "that" filmmaker when you're trying to make mass-market horror films. One should still note that it's a majority black cast (Elisabeth Moss is a notable exception), which is still fairly unusual for a film with blockbuster expectations. The genre is still a tough one to get a massive breakout in, though that's changing as studios put more faith, budget and advertising into them. In 2017, we had both Get Out and It, while last year saw A Quiet Place and the Halloween rebootquel put up huge figures. One of the things that helped drive Get Out to a big opening weekend (a now quaint seeming $33 million) was strong reviews that focused on the importance of the message of the film. Reviews are similarly strong here, though mostly they peg it as an excellent example of the genre rather than anything that's going to be in contention for major Oscars.